I only dirty one big pan (my favorite pan) to make this recipe, but I do it in a few different steps. Note that more oil instead of butter can be substituted below, or using avocado oil, a little olive oil, or this (unflavored) coconut oil can be substituted for sesame oil too, I just like sesame for Asian dishes. Part 2: Any of the following veggies you have on-hand, as much or as little as you feel like! First melt butter in a big pan (again, I use my favorite pan for this! ), add the oil and cashews and start to stir around until they just start to get a little golden, then add the sesame seeds. Keep stirring and keep heat low-medium so they don't burn. Once it's all toasted nicely, remove from the pan into a glass/ceramic bowl. Next cook onions, shallots, and/or garlic, ginger, etc. until golden in the butter and sesame oil. You may want to start the regular onion or shallots before the other stuff, as they take longer to lightly brown. When they're almost done, toss in the bell peppers 'til they just start to get soft. Remove everything from the pan into a separate glass/ceramic bowl. Next cook chicken with oil, butter, ginger, and salt until chicken is no longer pink, about 4 minutes or so on each side. Remove from pan into the glass dish with the veggies. Start adding the sauce ingredients to the same pan and stir around. 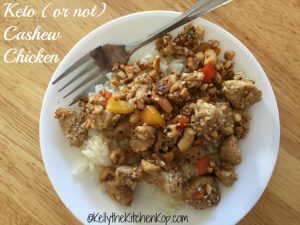 Cook for 2-3 minutes, then add back in the rest of the ingredients except the cashews and sesame seeds. Taste-test and add more of sauce ingredients if you think it needs it, maybe add a little more salt and pepper.